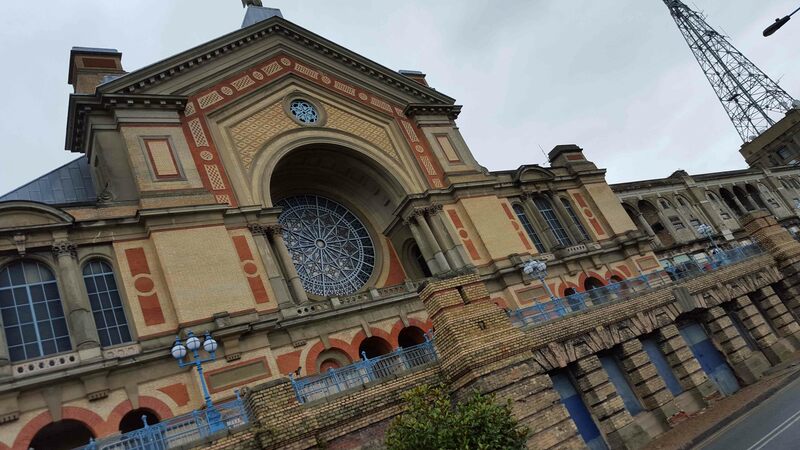 It’s THAT time again, the time when the exhibition hall at Alexandra Palace is invaded by armies of middle-aged women tugging wheeled suitcases to hold the spoils of the show. 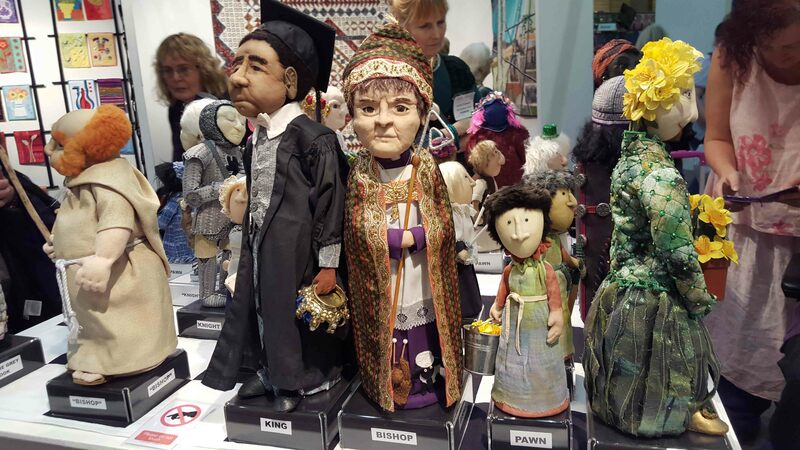 Yes, the 2015 Knitting and Stitching Show is open for business, not only that it is on for a full 5 days now! This is probably a good thing as I have been on Fridays and Thursdays previously and it has been horrendously busy, I’ve never been brave enough to go at the weekend! 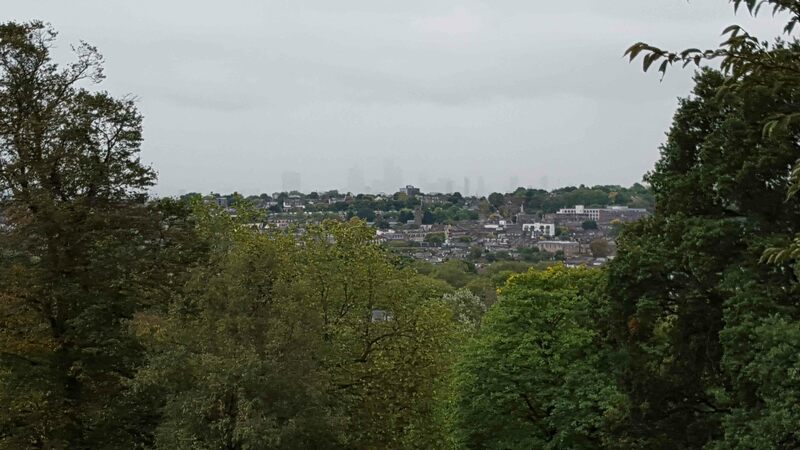 Today I went with daughter 2 and after an uneventful train journey we staggered up the hill from Alexandra Palace station (I thought I was about to have a cardiac arrest at one point) and arrived at the show which was ticking over nicely at the time of arrival at 11.30am. We thought that the first thing we’d do was to get a cup of tea and eat our lunch (bring your own food as catering here is not cheap or particularly inspiring) to avoid the predicted crush and with this in mind we made our way to the designated “picnic area”. 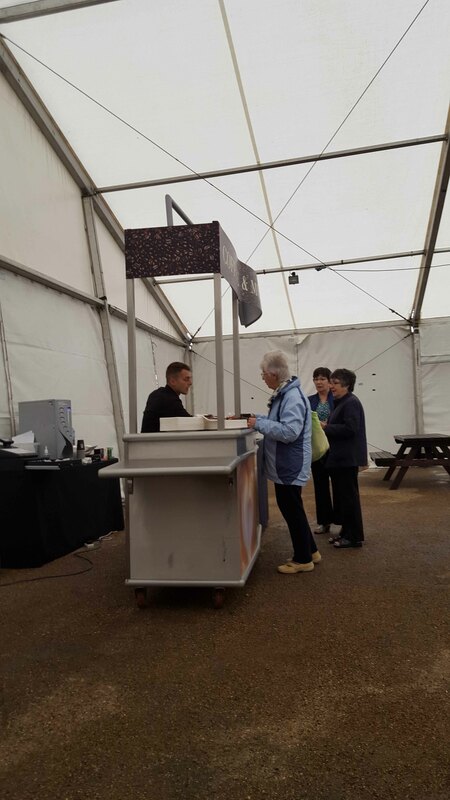 This is in a marquee alongside the main building but is access through the small exhibition hall. While it was shelter from the drizzle outside and had seats (picnic benches) I am at a loss to find anything else positive to say about it. the marquee had obviously leaked at some time in the night as the floor was wet and covered in puddles, the whole place was freezing and damp with a small coffee stand at one end. 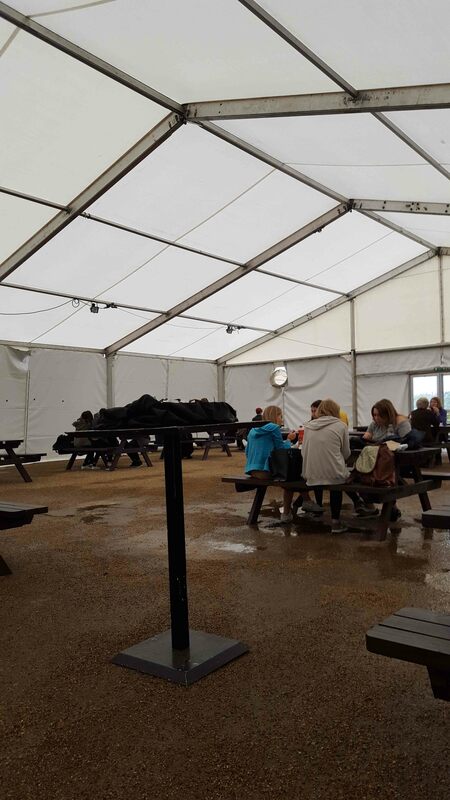 It wasn’t the sort of place which invited visitors to sit and enjoy a restful coffee and cake with their picnic lunch before piling in to the show proper. Marks out of 10 for this… 3 but only because there was actually somewhere to sit and there was a coffee stall (it only sold coffee, tea from a portable machine and a few muffins and cookies in a cellophane wrapper). For the entry fee to this event you’d think they could do a bit better than this. So a resounding “Boo” to Twisted Thread for the “picnic area”. After refreshment had been taken we pitched in to the exhibition areas and wandered up and down the aisles of traders and exhibitors. Many of the trade stands sell the same thing, and it begs the question “just how many quilting rulers and rotary cutters can a person need?” Not being a quilter, the answer for me is none at all, although I do own a rotary cutter which I never use because I don’t like it. There were many stands selling fat quarters, beads yarn of all shades and thicknesses as well as thread by the mile. 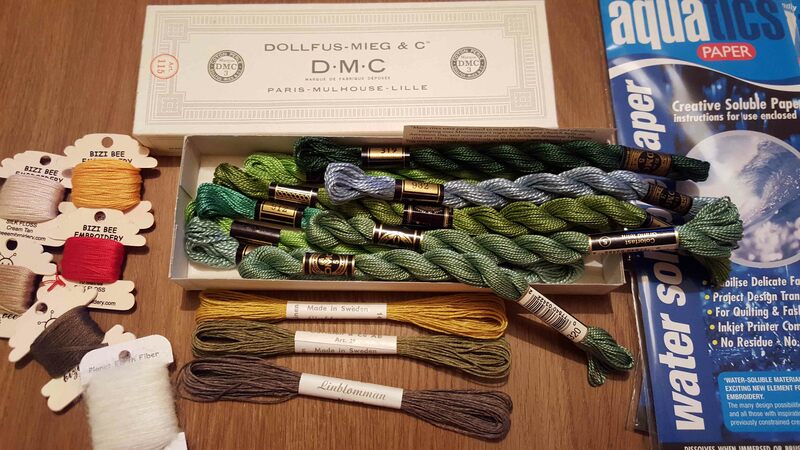 For my part, I found some lovely natural thread on the stand of “Rare Swedish Flaxen Threads” (http://linladan.com) as well as a pretty box of perle cotton threads in lovely greens – not a colour I generally gravitate towards, but these just spoke to me, so I am anxious to find a use for them. A second set of threads on small spools came from the fabulous Bizi Bee Embroidery (http://bizibeeembroidery.com) and the bonus with these lovely earthy colours was a yummy lemon lollipop! 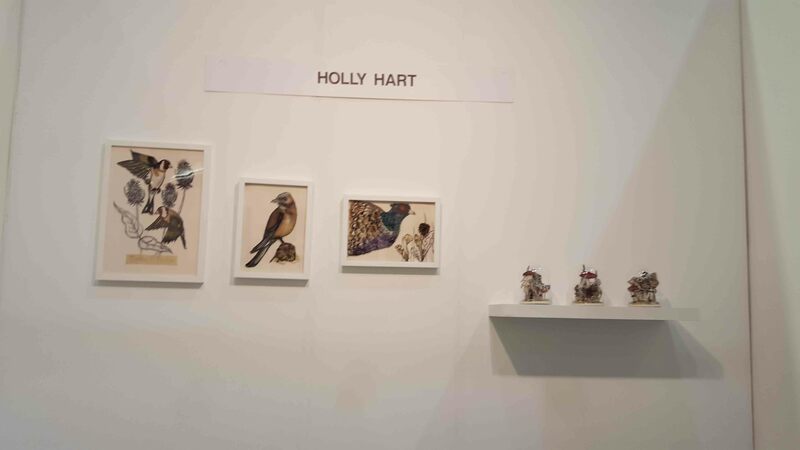 After a while most of the trade stands seem to dissolve into a blur, so it was with great relief that we came across the Holly Hart who was exhibiting her beautiful machine embroidered ‘flat taxidermy’ dioramas. Holly’s work is inspired by the natural world and memories of her childhood spent in her grandparents garden. 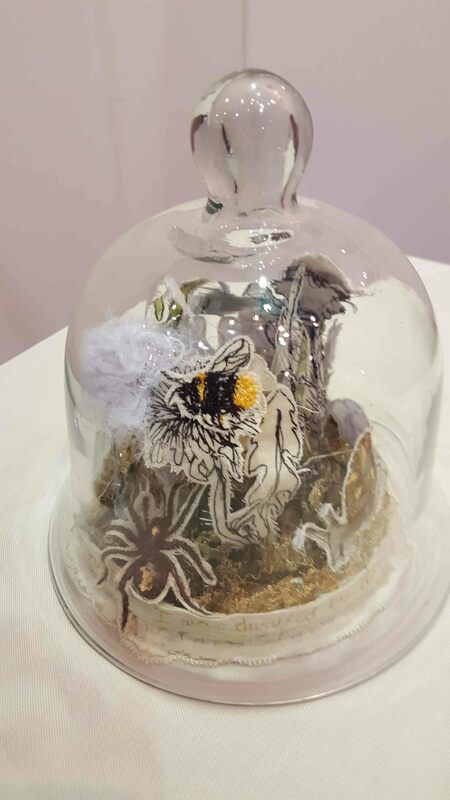 She makes the most intricate machine embroideries which are then arranged in the manner of Victorian taxidermy dioramas under glass bell cloches. 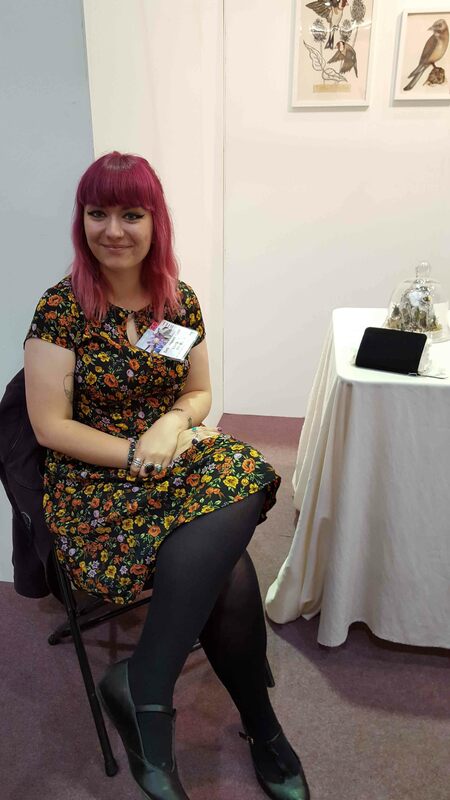 Holly was happy to talk about her work and the beautiful sketchbook she had with her. She is definitely “one to watch” for the future. Find out more about her at https://www.facebook.com/hollyharttextiles or at https://twitter.com/hollyhartart. Faith now being restored that there was something of interest at the show, just around the corner I met with another incredible artist – Lou Baker. I could wax lyrical about Lou’s work and indeed the artist herself. The work is really intriguing and completely unique and after a conversation with Lou about her work I am even more impressed and a Fan. Rather than me trying to explain her work or describe it here, pop over to her website at http://www.loubakerartist.co.uk/ and read her artist’s statement and blog. The gallery is fabulous and underlines how Lou excels as a maker and thinker. 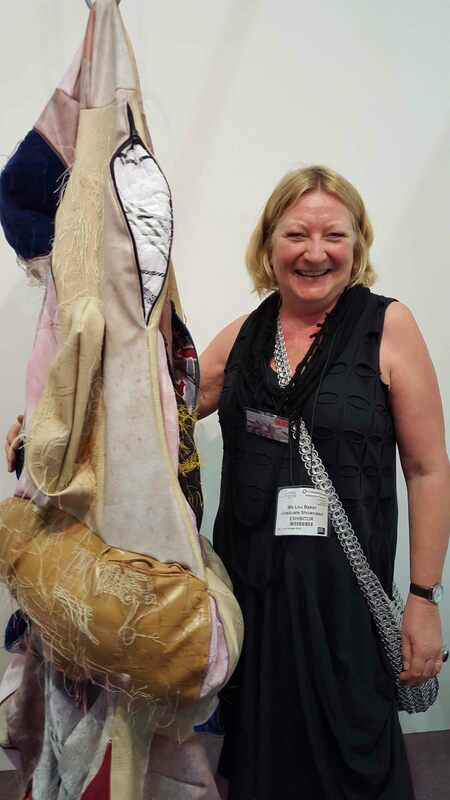 She was awarded the Embroiders Guild Scholarship for the Over 30’s for 2015 and received a bursary of £1000 as well as exhibition opportunities at the 3 Knit and Stitch Shows (London, Harrogate and Dublin). It was an excellent choice. 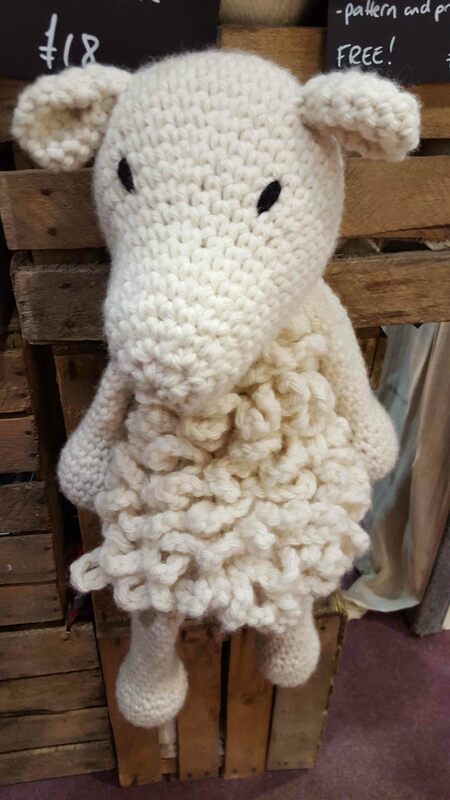 A final flog round the remaining trade stands found some interesting and funky knitted creatures at Toft Alpaca as well as some colourful felted images and the most incredible chess set made by the Quilters Guild UK. All in all the show has lots to see, but I do think that sadly this year it seemed a little more sparse than previously. The exhibition stands were fewer in number and I think also the trade stands, although there were still a great many stands selling the same products. Maybe this is down to traders having to commit to 5 full days, this is difficult for smaller traders. Maybe the K&S has become a victim of its own success – it does now have a sister show at Olympia in the Spring, so perhaps traders need to decide which is the better show for them. I hadn’t been for 3 years so it was interesting to see small differences. The door price is still quite high at £17 a head it’s a fair old cost for what is essentially a shopping experience, a sort of giant market where you are likely to part with even more cash, and with the added cost of travel it’s not a cheap day out. There are bargains to be had, but I don’t think it’s the sort of event to go to just to browse. If you know what it is you want before hand I am sure you can find the best deals – this is borne out by the vast number of people who attend pulling suitcases to stow their swag. Would I go again next year? Probably not as I think that any savings I might make on goods would be swallowed up in travel costs and the door price. The plus side is that I did meet two talented and delightful artists, which really made my day. 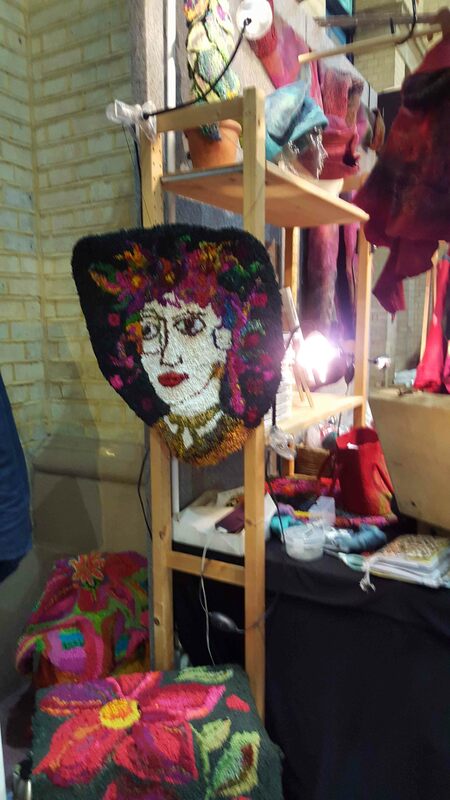 The Knitting and Stitching Show is at Alexandra Palace, London from 7 to 11 October 2015, entry costs £17. This entry was posted in acrylic painting, advertising, Art, art and design, batik, Books, ceramics, colour, costume, Crafty things, crochet, drawing, drawing and painting, eating out, embroidery, Expeditions and adventures, Fashion, Fine Art, hand embroidery, knitting, machine embroidery, mixed media collage, printmaking, procion dye, sculpture, sewing, stitching and tagged Alexandra Palace, knitting, Knitting and Stitching show, sewing, stitching. Bookmark the permalink. I loved reading about your trip and also these photos are beautiful! You wrote an incredible post by the way and I love your blog! Thank you. I’ve just read your post about The Sisters… definitely on my list of must reads now. Thank you. Thanks for this review, very helpful as I’m not going this year and felt that I was missing out; I don’t feel quite so bad now! Love your honest review of the picnic area too, it looks so dire it’s almost wonderful. Hahaha yes, the “picnic area” is a disgrace and I actually think it shows a lack of respect for the visitors. Well done for persevering. I couldn’t face it. The organisers have changed, but kept the same name. Their input is dismal, I don’t think it will be long before traders include those selling brushes and window cleaning supplies. Such a shame. Thank you for your kind words Laura. Meeting interesting artists is always a great joy. They were thrilled they had been given a mention in your blog! Thank you for pointing out the link errors, not sure what happened there as I normally cut and paste links directly from the websites concerned. Still all should be working OK now. Only too glad to mention great companies and lovely people. Hope you enjoyed the show. Thanks again, I have made the amendment and it seems to work OK now. Glad you enjoyed the show. Have you tried its sister show at Olympia? 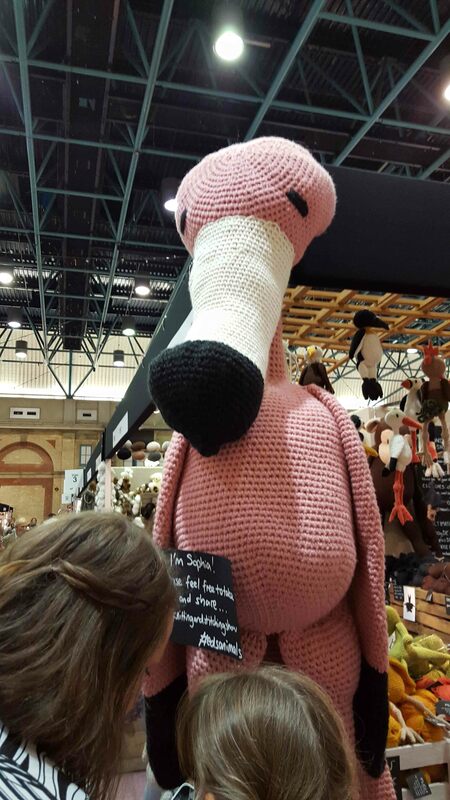 The Spring Knitting and Stitching Show is usually around March time and is a smaller and more intimate version of the Ally Pally event.